If you have an egg allergy, you can still make great pancakes! 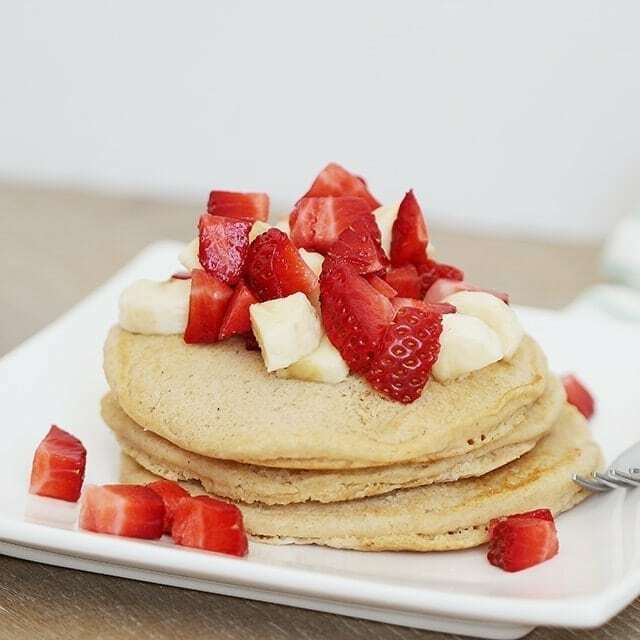 You won’t be disappointed by these fluffy eggless pancakes! If it’s necessary to eliminate eggs from your diet, baked goods, like pancakes, might not turn out the way you hope. Eggs provide structure to baked goods, so your pancakes are more likely to be crumbly if they are eggless. 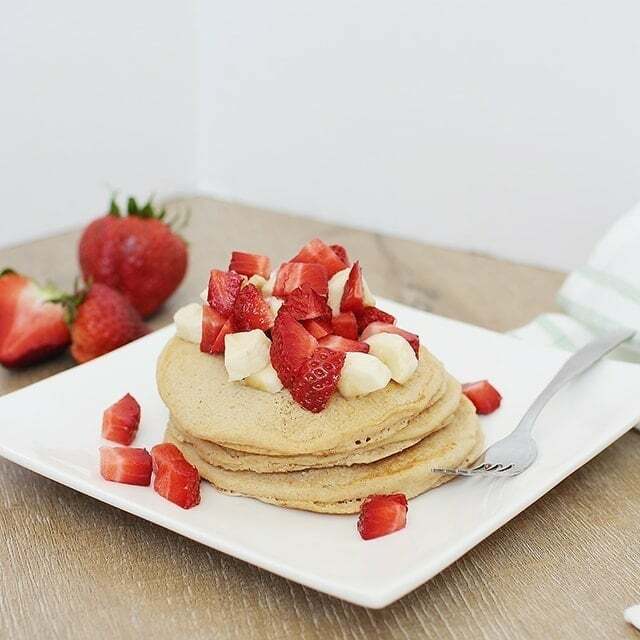 They also create a leavening reaction, helping foods like pancakes get a rise while cooking. Eggs also provide a rich flavor and texture. The good news is, some other ingredients can do this as well! 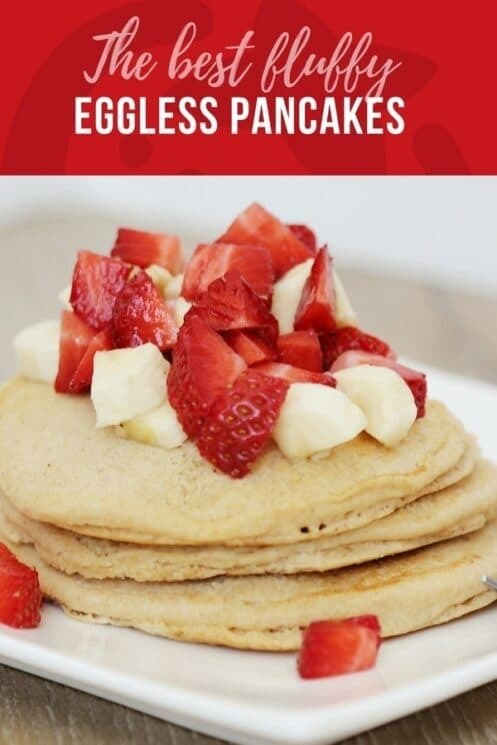 We have been able to successfully replace the eggs in these pancakes, making eggless pancakes you can’t get enough of. What are symptoms of an egg allergy? Food allergies are usually tough to diagnose. Elimination diets require very strict guidelines, and many kids aren’t exactly compliant if they are old enough to adhere to elimination protocols. The other issue that complicates things is that a food allergy can manifest itself differently in different people, and a child may have an intolerance to certain foods, and that can be hard to measure. Food allergies are also something that can go away as kids grow up. A child with an egg allergy, may not have an allergy to eggs when they are teens or adults. And finally, symptoms aren’t always immediate after exposure, so it’s hard to determine the cause. Asthma type symptoms. Tight chest, trouble breathing, etc. If you suspect your child has an egg allergy, talk to your physician about diagnosing and creating a plan for eliminating eggs. Organize your pantry to be allergy friendly as described here. And print our allergy substitution guide here. A commercial egg replacement product, such as Ener-G Egg Replacer. Chia or flax seeds mixed with water and allowed to gel. Fruit purees like banana, applesauce, or other fruit. A small mixture of baking soda, vinegar, and water can create a fluffy bread or cake. 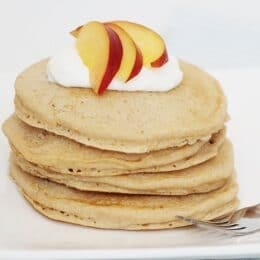 So, whether your family is vegan and eliminating eggs for that reason, or someone in your family suffers an egg allergy, try our eggless pancakes! We used 90% whole wheat to give the recipes some whole grain nutrients and fiber. We used a little white flour to create a fluffy, light texture. We used baking powder for leavening. We also used some coconut oil, for some healthy fats. What do you like to put on your pancakes? We love fruit and yogurt on our pancakes! 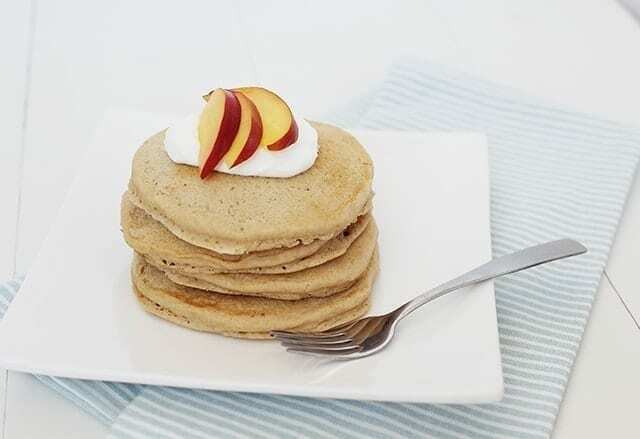 It brings pancakes the sweetness that we love, and gives us a chance to use seasonal fruit to really add some flavor. My favorite is strawberries and bananas, but as soon as peach season arrives, we are all in with the peaches! For more eggless breakfast ideas try smoothies or oatmeal. In a large bowl, mix flours, baking powder, sugar and salt. In a smaller bowl, whisk almond milk, coconut oil and vanilla. Pour wet ingredients into dry and stir until barely combined and no visible flour remains. There will be lumps. Set aside for 5 minutes. Spray a large skillet or griddle with cooking spray and heat over medium. Drop batter by the 1/4 cup and cook for 2-3 minutes or until bubbles form and edges appear dry. Flip and cook an additional 1-2 minutes or until golden brown. Continue until all batter has been used. Top pancakes with yogurt. Serve with sliced nectarines on the side, or on top of yogurt. Could you use regular milk or coconut milk instead of almond milk? My son also has Nut allergies. Hi Nikki, I think regular milk would work just fine in this recipe. The recipe is tasty as well as healthy as it contains fruit. The kids love this cake.